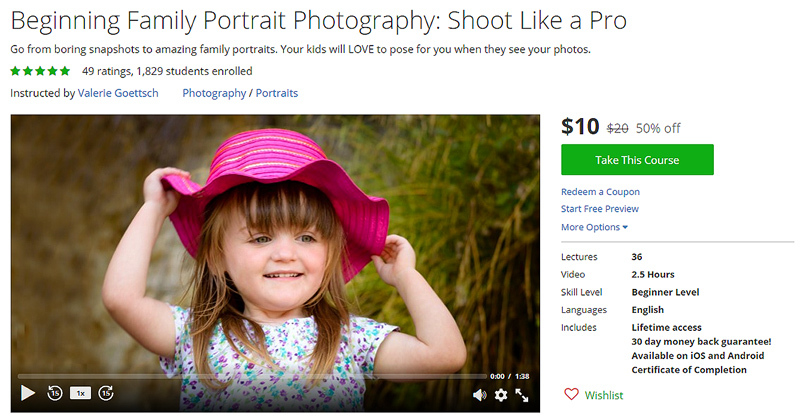 Home » Want to Take Amazing Portraits of Your Family? Hi, I'm Valerie Goettsch from Valerie's Photo Channel. Would you like to take professional-looking portraits without spending a fortune on equipment or getting hung up with a bunch of technical jargon? This course is for anyone who wants to learn how to take better photos. You don't need a full frame, high-end camera or expensive lens to take a great portrait. In fact, whether you have a DSLR, a point-and-shoot or smartphone camera doesn't really matter. It's more about the poses, lighting and background than the camera. My easy-to-follow online video course will show you how to improve your photos in just a couple of hours, and I'll even show you how to edit your portraits using Adobe Photoshop Lightroom. Posing ideas for women, men, teens and younger children. How to position your subject indoors and outdoors for the best lighting. The best types of lenses for portrait photography (for DSLR users). How to choose the right camera settings for more attractive, professional looking portraits. How to edit your photos using Adobe Photoshop Lightroom to make them look their best (you can get a free 30-day trial of Lightroom from Adobe). This course is for ANYONE who wants to learn how to improve their portrait photography skills and stop taking "snapshots." More than 1800 people are already taking my course and here's what they're saying about it. These quotes come from REAL people who signed up and paid for my course. Just check them out for yourself. This online course is fantastic. Valerie is able to explain in a very clear concise way how to take better portraits. I love the suggestions on poses for children. Lots of good information that is easy to follow. I loved the systematic approach starting with the parts and camera styles. It's like building something from start to finish. Brilliant! I'd highly recommend this course. I love taking photos but get lost with technical language. Valerie's lessons are easy to understand, she speaks at a pace where you can listen without feeling like you are missing important information and the information is easy to follow and implement. The course was very informative and well thought out to remove a lot of technical jargon or at least explain a lot of the basics. I would definitely recommend this course to anyone wanting to get more out of their photographs or to improve their portraits. YES! You can get my course, normally $20, for the special price of $10 but you have to act now! It will only be available at this low price for the next 30 days. I've worked hard to make this a fun class with easy-to-understand, practical information and examples. YES! I want to get your "Taking Family Photos Like a Pro!" video course for only $20 $10. To get your special $10 discount coupon, please provide your name and email below and I'll send it to you right away. I'm asking for your email because that's the only way I can communicate with you directly. Udemy is a great platform, but I won't be able to inform you about all my other, free lessons available on the 'net. Plus I like to know my students. I answer every question on my courses and other tutorials directly, via email. And it also gives me a way to get your suggestions on what other tutorials or videos you'd like to see. If you don't see the subscription box below, it may be because you have an ad blocker. Temporarily disabling it should make the form magically appear. I am so excited! I have watched so many videos on youtube and now I can’t wait to see what you have to share I am a beginner with a Canon t3i rebel. I do have a 50mm 1.8. Hi Robyn, you should have received an email with a link. I will email you directly. to take the course asap. What am I doing wrong. I have not received any info in my email box to click on. I just bought an EOS 1300D Canon and lens 18-135mm. Please guide me how to take a portrait photos and blur background. Waiting for your soonest response in my E-mail. Hi Omer, I think you’ll enjoy your new Canon! After you fill out your email address, you should get an email with the link to my course. I clicked on a link where you had said the video was free and needed up here where it is not free. Is there another one?